Time Tracking is available under the Customers Menu. There are two settings for Time Tracking that are included in the Company Settings. 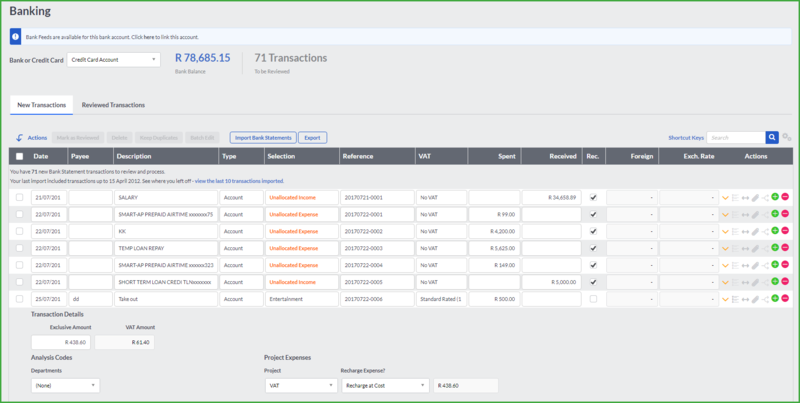 The option to display inactive projects for selection on Invoices and in Banking. Setting a Lockdown Date means that no timesheets can be processed or edited with a date up to and including the date specified. Users need to exist on your subscription and be added to the Company that you are working with in order for them to be available for the Time Tracking Module. 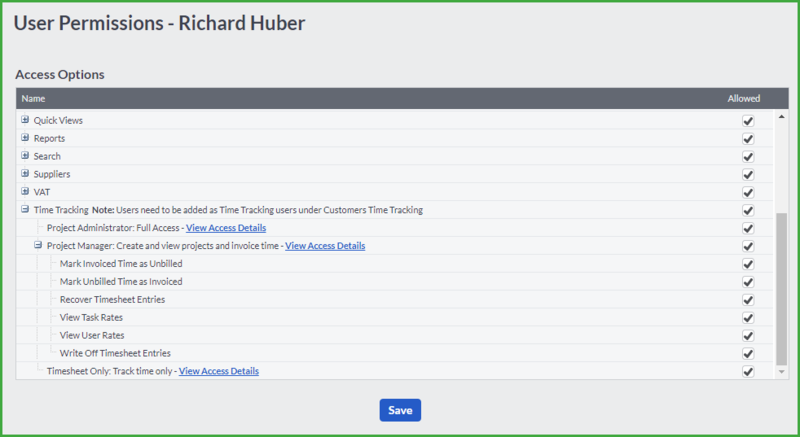 If you are the Project Administrator you will be able add and manage users under the Users Tab on the Time Tracking screen. You will see a list of all of your current and previous Time Tracking users. 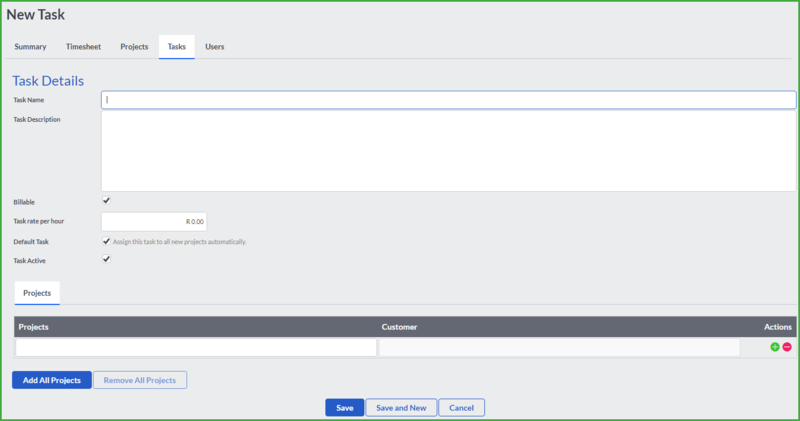 Name Select the user that you created in your Manage Users screen from the Name drop down menu. Rate per hour This is an optional field which allows you to specify the user’s hourly rate – this can be used if you choose to invoice your projects based on User rate per hour. This can be changed on specific projects. Cost per hour This is an optional field which allows you to assign an hourly cost to your user to allow for profitability reporting. Default User (Check box) If this option is selected then this user will automatically be assigned to any new projects that you set up. Add All Projects You can decide which projects your user will be assigned to. You can add all projects or only specific ones if you like. If a user has been removed from Time Tracking, your Company or your Subscription they will still display in the list and throughout Time Tracking but they will no longer be able to capture time. Under User Permissions you are able to assign your user to a particular time tracking level which will determine what they can do or see. Project Administrators have full access to Time Tracking, including viewing all projects, invoices and setting up tasks and users. Only Project Administrators have access to creating tasks and adding Time Tracking users. 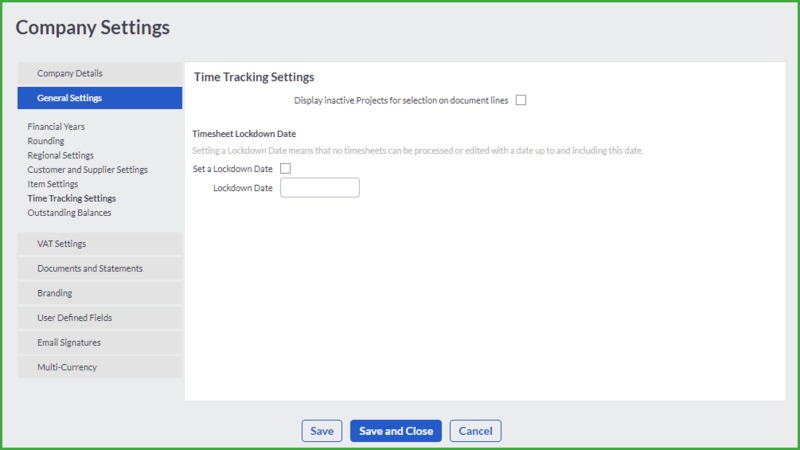 Timesheet only users can track time on projects they are assigned to. Only Project Administrators can add and manage tasks. This can be done under the Tasks tab on the Time Tracking screen. The Tasks tab displays a list of your tasks with the option to add new tasks or import tasks. If you want to make use of many tasks in your company we recommend importing them using our csv import option. When you add a task you will need to include a name and a description about the task. Billable (Check box) This is the default status of the task and determines whether this task should be billed to customers or not. 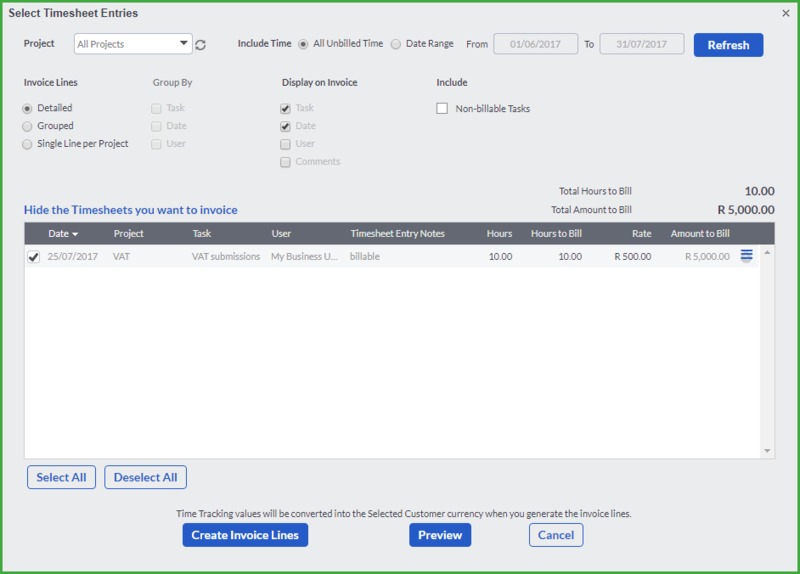 Task rate per hour This is an optional field which allows you to specify the task hourly rate – this can be used if you choose to invoice your projects based on Task rates per hour. This can be changed on specific projects. Default Task (Check box) If this option is selected then this task will automatically be assigned to any new projects that you set up. Task Active (Check box) If you are no longer making use of a task you are able to make it inactive by deselecting this checkbox. This will stop it from showing up on the Timesheet screen. Add All Projects You can decide which projects this task will be assigned to. You can add it to all projects or only specific ones if you like. Your List of Projects and all the information and actions will be discussed in the List of Projects section below. 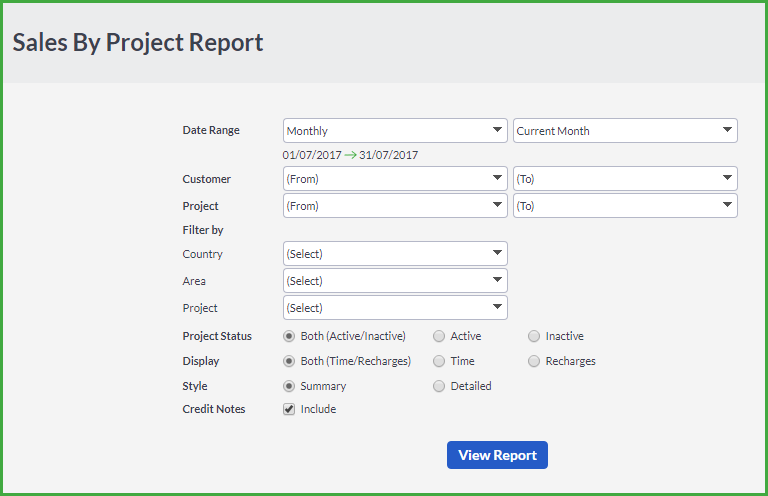 Projects are the most important aspect of the Time Tracking module. Everything to do with capturing time, recharging expenses and invoicing your Customers will be linked to a project. Depending on how you run your business you may want to set up one or multiple projects per customer. There is no limit to how many projects you can create. From the list of Projects you are able to add a new project or import a list of projects using a csv file. If you want to make use of many projects in your company we recommend importing them using our csv import option. Project Active (Checkbox) If you are no longer making use of a project you are able to make it inactive by deselecting this checkbox. This will prevent it from showing for selection on your Timesheets. Billable (Checkbox) This option will determine whether the time worked on this project can be invoiced or not. If you are planning on charging your customers for your time you should leave this option selected. Customer Each project must be linked to a Customer. You are able to select from your list of Customers in Accounting. Name and Description Include your project name and a description. Start Date and End Date These are optional fields to allow you to specify a timeline. Purchase Order No. An optional field to include for your reference. Project Budget This can be either on the project as a whole or built up based on budgeted hours per task. This is an important amount that displays in a number of places to assist you in keeping track of your targets. Fixed Cost → This is a single rate that you will charge for the whole project – all timesheet lines will be consolidated into one line on your invoice. Project Rate per Hour → Enter a rate for the project and this will be the billing rate per hour worked on this project. User Rate per Hour → Project will be billed using the relevant user rate. Task Rate per Hour → Project will be billed using the task rate. Invoice Lines This is the default setting for the project at the time of invoicing and will determine how your timesheet lines appear on the invoice. Task Detailed → Each timesheet task will appear as a separate invoice line item. Grouped → Timesheet tasks will be grouped on an invoice line. Single Line → This will consolidate all timesheet tasks into one invoice line per project. Your default tasks will be automatically included for all new projects created. You are able to add all and remove all task as well. You can change the default rate per hour for each task on a project and also specify whether it is billable or not. If you selected to base your budget on your tasks then you will also be able to enter your budgeted hours for each of your tasks and track these against the actual hours worked. Your default users will be automatically included for all new projects created. You are able to add all and remove all users as well. You can change the default rate per hour for each user on a project. Your list of projects will display all of your projects grouped by Customer. We have included useful information showing you how much time has been captured on the project and we have also included this in relation to a budget. If you have set up a budget you will see a progress bar measuring hours worked against your budget. Make use of the search option if you need to find a particular project or customer. Active Projects This will show all your active projects and display the hours related to them. 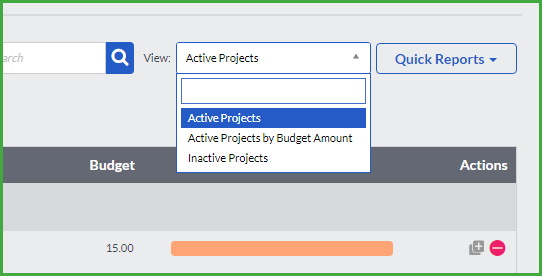 Active Projects by Budget Amount This will show your progress bar in value terms. Inactive Projects This gives you access to the projects that you are no longer working on. Copy Project (action available on each line) If you have similar projects you can copy one project to create another. 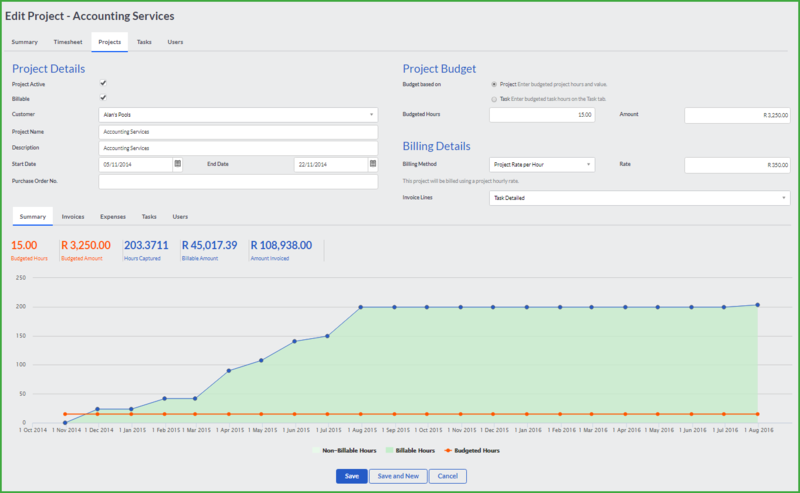 Create Invoice * You can create an invoice for a project or multiple projects per customer. * If you have unbilled hours for a project you can identify them on this screen and invoice accordingly. Delete You can delete any projects that do not have any activity. If a project has been active you can always make it inactive. Write off Hours * If you have billable or unbillable hours that you would like to write off you can do this across all projects by using the Write off hours action. * This will lock the timesheet so that it can no longer be edited (the same as invoicing). * It will no longer be available for invoicing. Recover Hours If you wish to recover any written off hours and make them billable again you will make use of the Recover Hours action. Mark Invoiced Hours as Unbilled * If you have invoiced hours or even marked them as invoiced and you wish to make these hours billable again then you will use this action. * You may need to do this if you have partially credited some time using a credit note. Mark Unbilled Hours as Invoiced * This will mark the time as invoiced but not actually create an invoice for the customer. * This has the same effect as an actual invoice or even a write off. * The time sheet will be locked for editing and will not be available for invoicing. * This option is useful if you invoice your time manually or do no make use of the time worked to generate invoices. When you click through on a project you have access to all the information you require relating to that project. The summary tab will show you the progress of your project in relation to your budgeted hours in a graphical view. You will also see important information relating to the billable value of your project based on hours worked as well as the actual amount invoiced. This will display a list of invoices relating to this project. This will show you all the expenses captured for this project and whether or not it has been recharged to the customer. You can track your progress against budgeted task hours if you have set this up. All the users allocated to the project will display on this screen. You can also change their rate/hour. In order to record the time that you have worked on all your projects and customers you will make use of the Timesheet screen under Time Tracking. You are able to capture your time for all projects and tasks that you are assigned to in either a daily view or a weekly view. You can also add projects and tasks on the fly, directly from the timesheet screen. 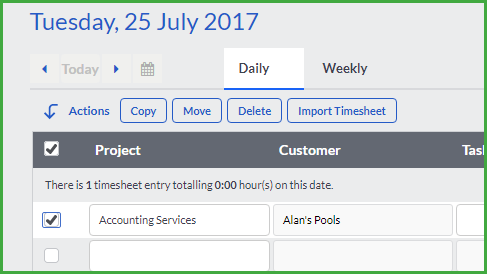 On the Timesheet daily view, in addition to typing in your hours worked or making use of the slider, you are also able to track your time by using the built in Timers. 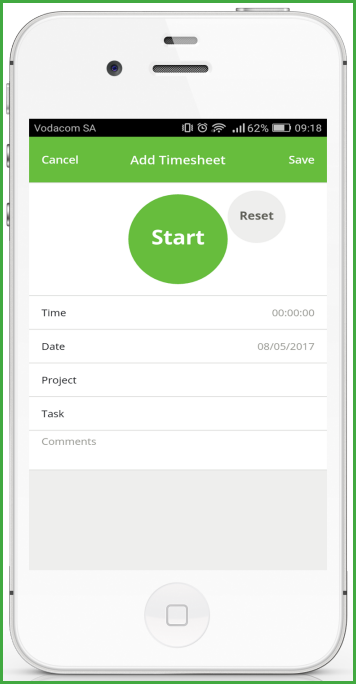 With these you can start or stop a timer to record the exact time you have been working on a particular task right down to the nearest minute. If you are a Project Administrator or a Project Manager you are able to view and even capture time on behalf of other users linked to the same projects. Simply select the user from the drop down on the top right of the page. You can import your timesheets from a csv file. Click on the “How do I set up a CSV file?” link for guidance on how to populate this file and to download an example file. The timesheets will be imported for the user that you are currently viewing. To capture time you will navigate to the date you want to capture using the date picker. Project Select the project that you are working on (the related Customer will display). Task Choose which task you were working on. Enter Time Either use the time slider or enter the hours worked. Comments On the daily view you can enter comments on the work you have performed. There are actions that you can do per line as well as multi-actions that you can do to all time entries on a timesheet. Copy You can copy a time entry to another date – this is useful if you often do the same work. Move You can move a time entry to another date. Delete You can delete one or multiple time entries. The summary tab under Time Tracking is there to give you an overview of what has been happening with your projects, tasks and users. You can view it daily, weekly or monthly. Hours Captured This will show your Hours Captured and what proportion of those hours are billable – this will help measure the efficiency of your staff. Hours Captured – Invoiced Value This will display the amount you have invoiced for the day, week or month. Hours Captured and Written off This will display the hours and value of written-off time. The whole principle around time and billing is the ability to actually invoice out the time that you have worked. In Accounting you can invoice out all of your unbilled time that you have captured under time tracking. We have also introduced the option to invoice out tasks linked to projects manually without linking to any time captured. This will allow you flexibility and also the option to create quotes and recurring invoices. This will launch the “Select Timesheet Entries” popup. This will allow you to select and invoice the specific time that you wish to charge your customers. Below we will explain all the options available to you. 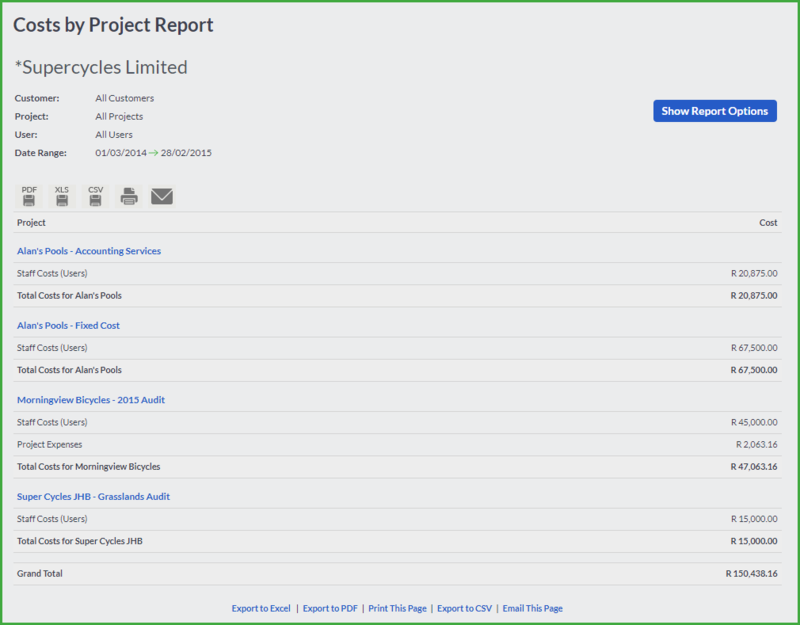 Here you will select which project you are invoicing if you have multiple projects per customer. You have the option to invoice all of your unbilled timesheets or specify a date range to only use time worked for a specific period. For example you can only choose to invoice time worked last month. Remember to refresh the grid to update any changes in the date range. These tasks will still pull through at a zero value because they are unbillable, however, if you wish to display the unbillable work that you performed then these timesheets are available for inclusion. 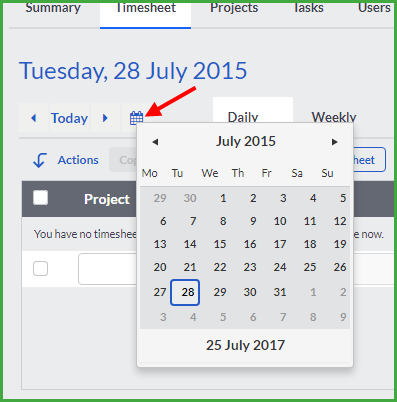 This will display the list of all your timesheets that have been entered for the projects you have selected in the date range you have chosen. You are able to select which timesheets you want to invoice and you can also update the Hours to Bill, the Rate and the Amount to Bill. The icon on the right of the timesheet entry will tell you the billing method you selected for this project (for example Task Rate per Hour). 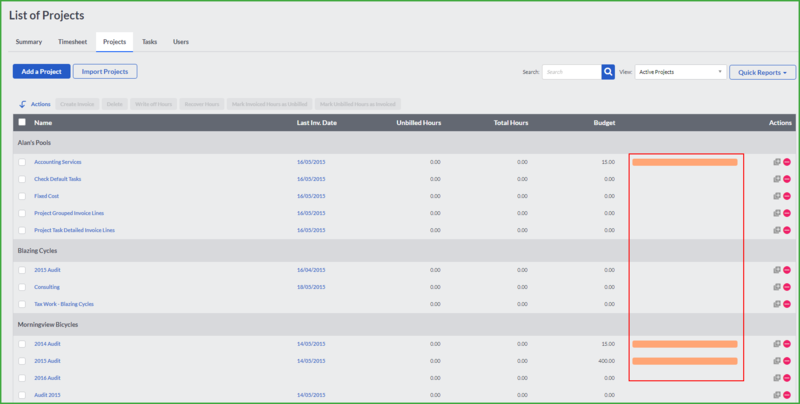 At the bottom of the screen you have the preview option – this will help you get a view of what you are going to invoice and how it will look – you can change the Invoice and Display options and use the preview option to visualise the effect. 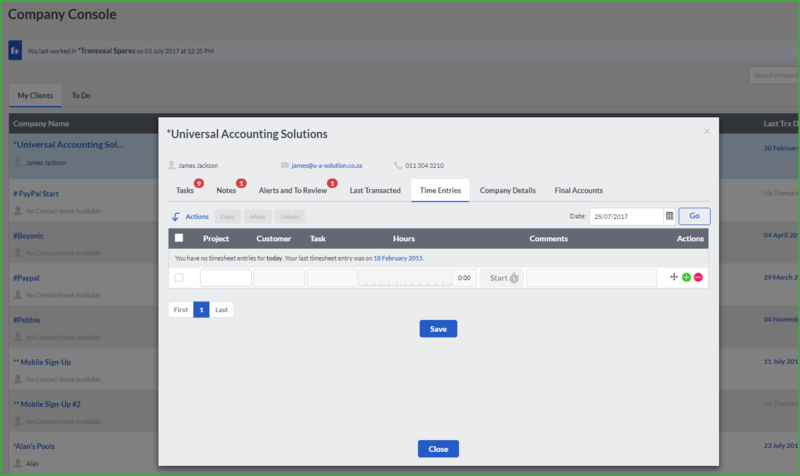 Once you are happy with the timesheets you want to invoice and how you want them to display you can create your invoice lines. This will populate the invoice document. All timesheets that were selected or part thereof will be marked as invoiced – this means that they will be locked on the timesheet screen and they cannot be invoiced again. If you wish to mark the remaining time as invoiced or if you wish to mark any of the time as unbilled – this can be done from the list of projects under Time Tracking. Invoicing with regard to fixed cost projects works a bit differently to the other billing methods. This is because there is one fee for the whole project as opposed to a rate per hour worked. How this is handled in Accounting is that the full fixed cost will be used when you select to invoice this project. You can still choose to mark which timesheet entries are invoiced or not but this does not affect the price. On the invoice itself you can change the amount to bill if you wish. For example you may only want to invoice 50% of the project. All Timesheet entries that you invoice will be recorded in a system account called “Sales – Time”. This is a sales account that records the value of amounts invoiced on all of your projects. When you create a credit note from an invoice that contains timesheet lines or if you link a credit note to an invoice that has timesheet lines, you will be able to reverse the time entered and this will filter back to the timesheets and mark them as unbilled. If you have grouped your timesheet lines together (for example 10 timesheet lines for various users and tasks) into one invoice line for 10 hours and you credit only a portion of this time (example 5 hours), we have no way of telling which timesheets were credited and which ones were not. What the system will do is reverse ALL timesheet hours (not just the portion), and you can correct this by using the “Mark unbilled hours as invoiced” option on the list of projects screen in Time Tracking. What this document type will allow you to do is create the document for a customer for a project without having to actually capture the time, ie. a timesheet entry does not exist for which you will use this time. We recommend that you make use of this document type if you need to quote your customers for work to be done or if you wish to set up a recurring invoice for work that you may do on a monthly basis. 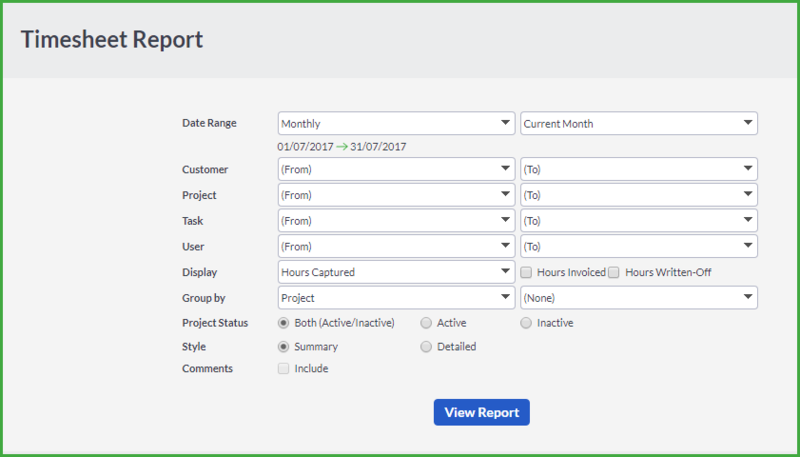 Although this time is not linked to any timesheets it is still linked to the project that you are working on – in other words it will still be available for reporting on the sales by project report and on the project itself. Remember – When you do capture the time relating to this invoice you can always “mark the time as invoiced” from the Time Tracking screen under projects. You may incur expenses on your projects that you want to recharge to your Customers. Any expenses that have been paid through your bank account can be assigned to a project. On the banking screen, any amount spent and assigned to either an expense or a supplier can be recharged to a project. When you invoice your Customer you can select to recharge your expenses as well. You can invoice your expenses in detail, ie. 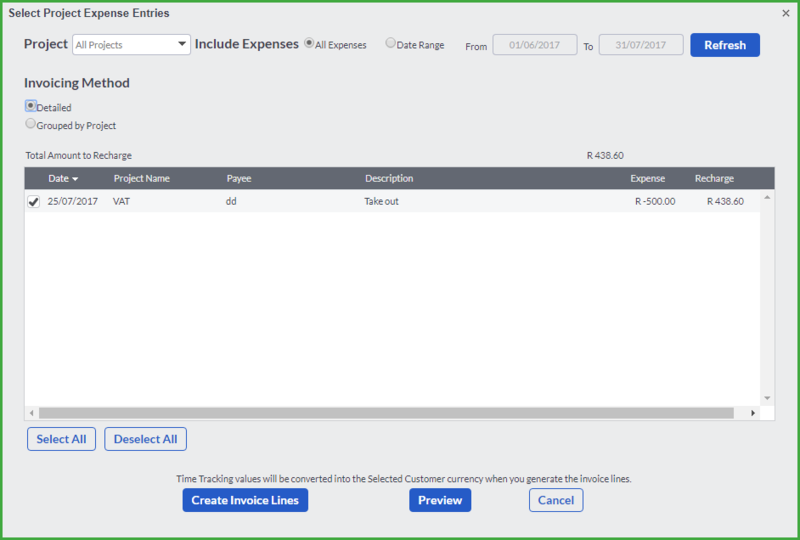 a line per expense or you can group all expenses together relating to one project. You have the option to invoice all of your unbilled expenses or specify a date range to only bring through expenses incurred for a specific period. For example you can only choose to invoice time worked last month. Remember to refresh the grid to update for any change in the date range. You are able to edit the amount you want to recharge in the grid or on the invoice. This is a detailed report which allows you to view all time that has been captured. The filters allow you to limit the detail in the report to view only the specific information you want to see. The grouping option allows you to group the timesheet information to make it most relevant to you by combining related time entries. 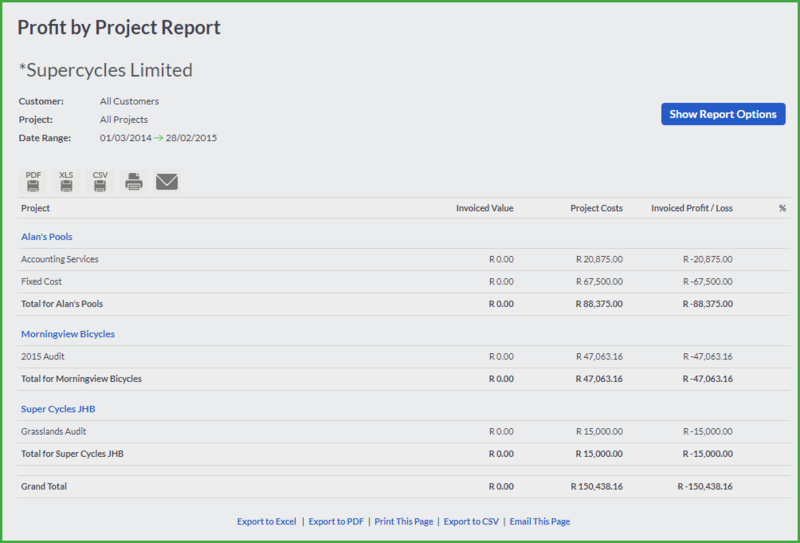 This report will display the value of Time invoiced per project. Run it for a specific period to determine the amount invoiced per project for that period. The detailed level will show you the invoices making up the balance. 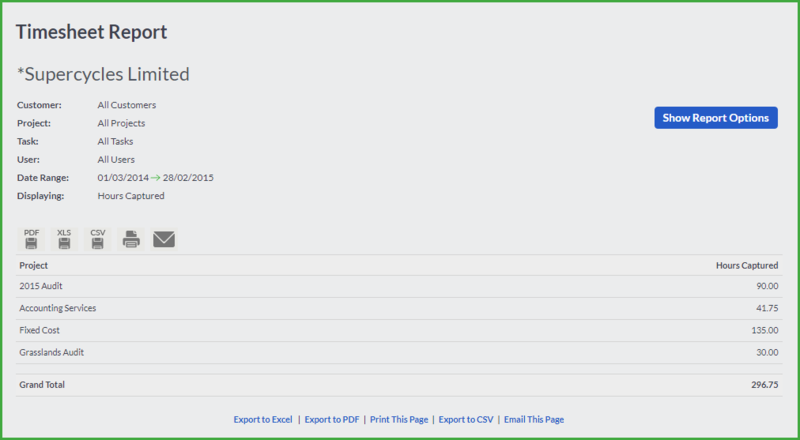 You are able to drill down to the actual invoice from this report. If you are a Project Manager you will only see the projects that you have been assigned to. The audit trail will allow you to check when your time entries were created and edited. It will also tell you whether another user has captured or edited time on your behalf. This report will show you whether your project is profitable or not by comparing the amounts invoiced against the costs of the project. Invoicing will include both time billed to the customer plus expenses that have been recharged. You can also include expected billings by ticking the Work in Progress checkbox. This will calculate your expected profit based on hours worked multiplied by the billing rate for that project. The project costs will include both project expenses as well as the user costs of working on the project. The user costs are determined based on the number of hours worked multiplied by either the Cost per Hour or Rate per Hour for the user. This report will give you a breakdown in either summary or detail about your costs incurred on each project. This includes both user costs based on the number of hours worked and project expenses. You can even track your time via our Time Tracking mobile app for IOS and Android. This can be downloaded from the Add-ons page. If you are a registered adviser you will have access the Accountant Edition. If you have Time Tracking enabled in addition to this you will be able to Track your Time from the Company Console. You are then able to track your time for each of your clients directly from the Company Console.